Actually, we already got married on a wonderful day of December 19th 2018 in Cape Town. 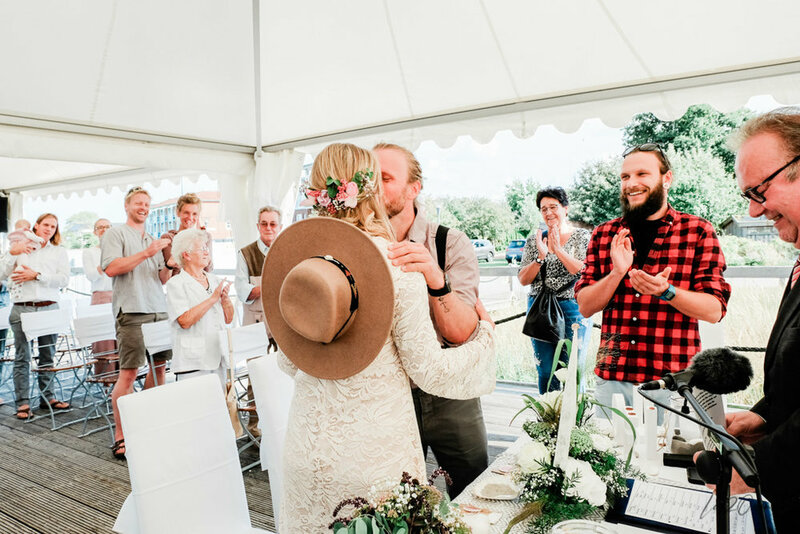 We had a great and happy wedding day with our witnesses Manu und Nina, as you can read in my post “The Story Of Our Wedding Day” . 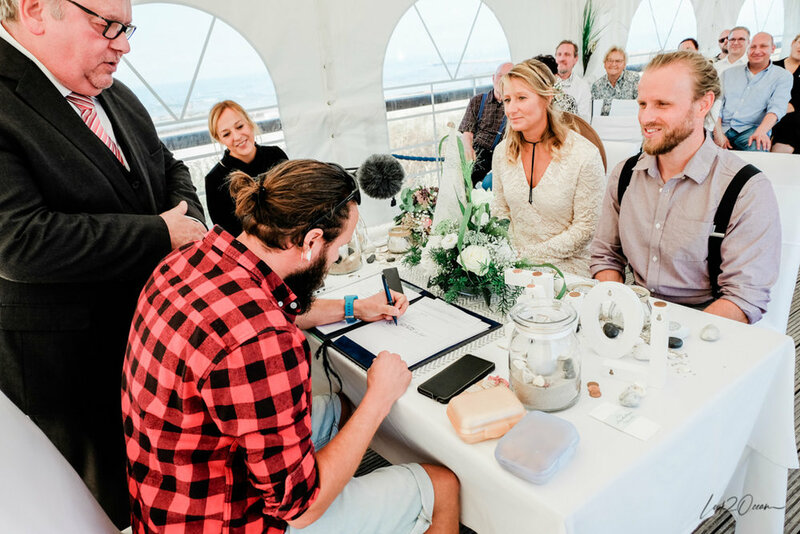 But in order to make our wedding official and to get around the paperwork, we decided to go for the second round, the civil wedding in Germany. It was also very important to us that our family could enjoy our wedding as well. Because they couldn't join us in Cape Town. 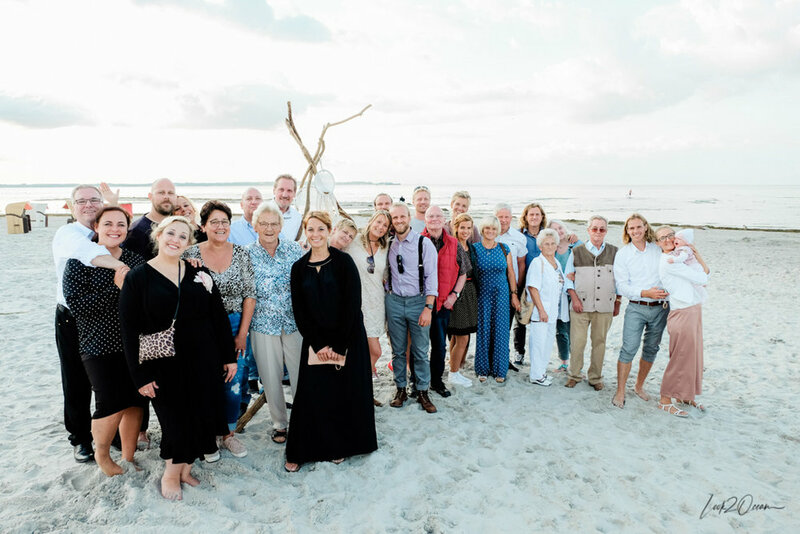 After all we wanted to surprise our family with this second wedding, so we invited our family and friends to an “After-Wedding-Summer-Party” at the Beach-Bar “Tatort Hawaii” for August 31th 2018. Officially it should be just a late summer party. We only inaugurated our two witnesses Xaver and Rebekka. When all of our guests arrived we had coffee and cake at the beach. Daniell and I couldn't eat anything because we were pretty excited. We still had our speech before us in which we wanted to announce our surprise. After our announcement our family was first speechless and then very delighted about our plan of another wedding ceremony. Unfortunately or even fortunately we didn't have much time, so we immediately went over to the pavilion where the mayor was already waiting for us to do the wedding ceremony. The ceremony was filled with a beautiful speech and some funny words. It was just an amazing and unforgivable time, we could share with our family and best friends. The following photos speak for themself, so I don’t want to say too much, just check them out. You will see how nervous and happy we were at the same time. And now let me take this opportunity to mention a few words about the location. When we were looking for a suitable location, we came across the bar “Tatort Hawaii”. Only since a few years it is possible to be married at the beach by the mayor of the small town called Stein. The wedding ceremony takes place on the beautiful dune terrace with a view of the bay. After the ceremony, some tears of joy, happiness and relief that everything worked out, we toasted with a glass of Prosecco directly at the beach while the sun went down. Again we had such a big luck that the weather was on our side and gave us a wonderful, warm day and evening. We could enjoy a wonderful sunset at the beach and afterwards the summer-party could start. We had the possibility to rent the beach lounge area of the “Tatort Hawaii” and they supplied our guests with drinks at their own boat bar and fantastic barbecue which was prepared by a regional catering company. The staff and the owner of the bar were curious about our ideas and helped us with everything to organize our wedding-party. I also would like to use the opportunity to thank all our guest for sharing with us this special day and, of course, our witnesses, who helped us to make this day so wonderful. Like the grandparents of my husband. These pics say more than anything else. Of course, love isn't always about romance. For sure the grandparents could tell us many stories about it. But I think we can all agree, that we all need some love. It's absolutely necessary for having a happy life. That’s why I would like to share with you some points which are very important for me having a good relationship with the love of my life. Just think about it and if you feel to discuss or say something about it. Feel free, write me your opinion, experience and ideas in the comments. Looking forward to hear from you. 1.First, you have to love yourself. 2.Be someone you would love. Last but not least I don't want to keep from you that we had after the barbecue a great party with great conversations, good drinks and fantastic music. Daniell's brother, who was also his best man, hired a super cool music band called “Tequila And The Sunrise Gang”. It was for us an awesome surprise. The band played more than 2 hours and gave everything to provide a fantastic atmosphere, as you can see on the pics. So that was our official wedding in Germany. I hope you enjoyed this little story. For us it was a wonderful and unforgettable time that I’m not getting tired to speak about it. If you feel the same, don’t hesitate to share with us your wedding story. Leave a comment. Oh…I would love to hear your story!!!! PS. : Big thanks to Jess (girlfriend of Daniell’s bother) for capturing all the unforgettable moments and to my husband for the beautiful editing of the photos.